We gather again beacause we remember. We remember what happened. We remember those that fought. We remember those that died. And we remember those that kept that memory alive: Marek Edelman, Jacek Kuroń, Zofia Kuratowska, Anka Kowalska, Lechosław Goździk, Mirosław Sawicki, Symcha Rotem Rathajzer alias „Kazik”, Noemi Korsan, Chawka Raban, Julia Hartwig and many others. 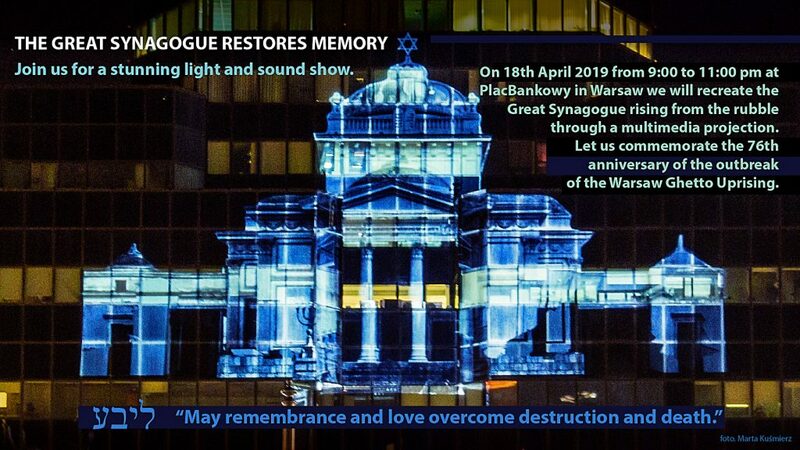 Like Marek Edelman, we see the commemoration of the Warsaw Ghetto Uprising as a matter of memory, regardless of the current political climate. We do not want and cannot take part in the official celebrations as they have been entirely appropriated by politicians, are full of empty, national rhetoric and will be attended by the representatives of the president’s office and of the government, whose prime minister layed down flowers for Nazi collaborators from the National Armed Forces (Holy Cross Mountains Brigade). Nowadays antisemitism, xenophobia and intolerance are rife in our public life and the authorities encourage them. In the face of this we will not remain silent. Several dozen people have demonstrated on 20 February in support of the Ombudsman, Adam Bodnar, who has been sued for defamation by the Polish Television for his remarks that the hateful coverage by the [nominally] public media might have inspired the murderer of the Gdansk Mayor, Paweł Adamowicz in January. ” Dr Adam Bodnar sets an example of the civic ethos as one of the last defenders of freedom and the constitutional rule. He personifies the values of equality, respect and independence, which are so dear to us” – said the demonstrators in their letter of support for the Ombudsman. Speaking to the demonstrators, a Warsaw University law professor Marcin Matczak has warned against the law being increasingly used against those criticising the authorities. „Poles have sucked anti-Semitism with their mothers’ milk”. Not only is this an unjustified metaphor but also, and foremost, bad phrasing and deceitful and harmful language. Every politician, every public person should be condemned for speaking this way. The Israeli Minister of Foreign Affairs, Israel Katz, should apologize in public. Unfortunately, the list of politicians who should apologize for their racist, homophobic, anti-Semitic, anti-Ukrainian and anti-Roma statements is quite long. Anti-Semitism and other anti-isms are not a feature of a particular nation but they happen far too often. The reason lies in poor education, ignorance and the choice of some politicians to be active in politics by stirring fear and hate. Anti-Semitism is present everywhere but let’s focus on what concerns us, let’s talk about Poland where there are almost no Jews but anti-Semitism does exist. It is a fuel to horrid campaigns which are being undertaken with more and more boldness in the public space and on the Internet. Let’s not speak of “the mother’s milk” or of inheritance, even though it cannot be denied that “As the twig is bent, so the tree grows” and as the Polish proverb says “What little Johnny has not learned, big John will not know”. It is acceptable to proclaim that real estate should not be returned to its owners and that those who have lost their property in the Second World War should not be compensated, even though we consider such views as wrong and unjust. To claim, however, that the victims should not be compensated if they are Jewish is to incite hatred based on national and ethnic difference, which is against Polish law (the Article 256 of the Penal Code). We protest and call to protest against this outrageous anti-Semitic campaign. On behalf of the Associaton: Chair of Programme Board, Paula Sawicka and Chair of the Board, Marek Gumkowski. Following a report by the Open Republic, the prosecutor’s office in Częstochowa has instigated court proceedings against a popular right-wing rapper “Stopa” for the publication in the social media of an antisemitic composition “If I were a rich man”.